Part of the cover of the 125th anniversary issue of the Science magazine. The Science magazine published by the American Association for the Advancement of Science marked the 125th anniversary on July 1, 2005. The issue to celebrate this occasion includes the special section entitled "What don't we know?" . 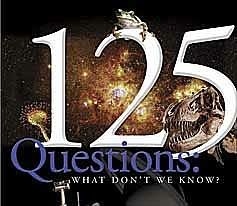 The section lists and explains 25 big questions facing science over the next quarter-century and 100 smaller ones (the total number of questions equals the number related to the anniversary). For those who are interested in the future of science, I cite the list of the big questions here. How Did Cooperative Behavior Evolve? What Can Replace Cheap Oil -- and When? Which questions are you most interested in? I am interested in questions 1, 5 and 21 as a physicist; in 2 and 6 as a human being; and in 10, 11, 23 and 25 as a being living on the earth. I would also like to introduce to you the 100 smaller questions in subsequent blogs, if possible.